A novel approach to dessert. The crushed nuts add crunch and eye appeal. You can also cut the apples in quarters and place a few different varieties on each stick. Marinate apple halves in all ingredients except walnuts. Preheat grill to medium high. Cook as per directions for direct heat method for 5–6 minutes, turning once until golden brown on the outside and just warmed through on the inside. 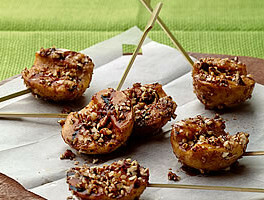 Remove apples from the grill, cool for a few minutes, and roll in crushed walnuts. Press gently. Place a skewer in each apple half and serve.